Google Toolbar 7.1 for Internet Explorer has a new feature that shows Web pages, news articles, places, images and videos related to the current page. The feature is called Google Related and it's a bar displayed at the bottom of the page. "Google Related is a browsing assistant that offers interesting and useful content while you are browsing the web. 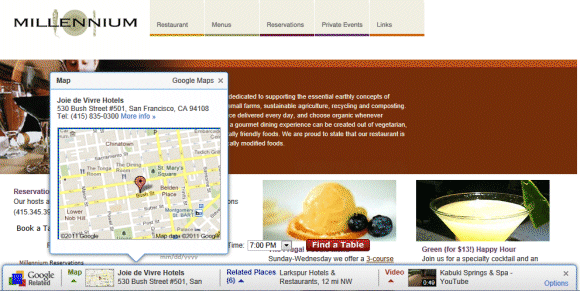 For instance, if you're browsing a page about a restaurant in San Francisco, Google Related will assist you by displaying useful information about this restaurant such as the location of the restaurant on a map, user reviews, related restaurants in the area, and other webpages related to San Francisco restaurants - all in one place," explains Google. 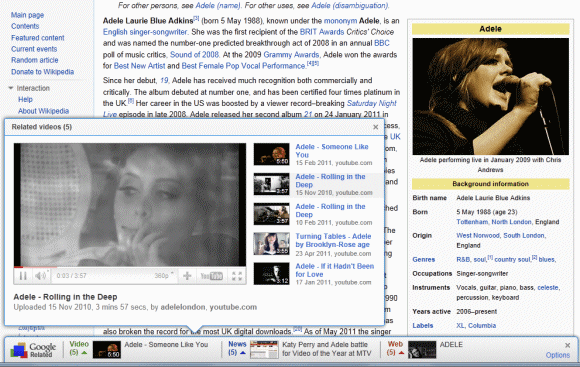 If you go to the Wikipedia article about Adele, Google Related shows 5 YouTube videos, 5 articles from Google News and 5 pages from Google Search. Google Related is another feature that requires sending the list of all the pages you visit to Google's servers. To find related pages, Google needs to know the URL of the page you're visiting. The so-called "enhanced features" (PageRank, SideWiki, Google Related) send Google a lot of useful data. One of the most interesting ways to use the data is a feature that shows if a site is slow. Like all the other Google Toolbar "enhanced features", Google Related can be disabled from the "Options" dialog by clicking the "Privacy" tab. Apparently, Google Related only works if you've configured the toolbar's search site to be Google.com (United States of America - .com), so you may need to change this setting to enable Google Related. I don't see it in the privacy settings. It works in IE9, but Google doesn't mention that the feature is IE9-only. Make sure that you have the latest version (7.1.1920.1238) and that the Google site is set to USA (.com) in the "General" tab. 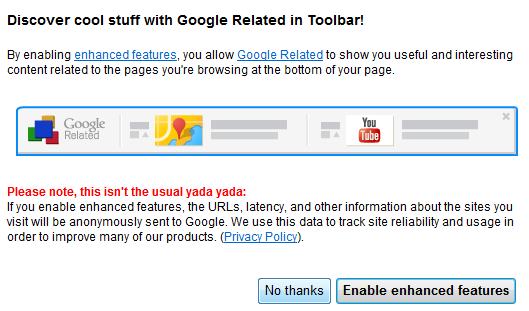 I've installed Google Toolbar in IE6 and Google Related wasn't available. After upgrading to IE8, the feature showed up. Yep, Google didn't upload version 7.1.1920.1238 on their download site. It works now. I'm guessing this is based on Similar Pages, probably uses the same technology. Does anyone know the div name of the related bar so I can make sure it doesn't pop up when people are on my site. Kind of drives me nuts that I go out and advertise and then all my competitors show up right in my page. Thanks! I don't get an option to say No Thanks - just a button with "Ok" (yes, lowercase k) and I can only close IE with task manager! It has sterilised IE. It hasn't appeared on Firefox so I'm just using that. I don't want GR, haven't acepted it, but can't get rid of it. I had the same problem of not being provided with a 'no thank you' option. It was click on 'okay' or nothing. I was forced to close IE8 using the task manager. In the end I disabled the Google Toolbar and this appears to have stopped Google Related from trying to force you to install it. I hope that this works for you. Likewise, the option to (possibly) load Google Related opens automatically when IE is loaded and you have no option but to click on the Ok button - everything else is disabled. This is suspciously like how malware loaders behave and I'm surprised Google (if it's them) used this method. I also had to close IE via Task Manager and I too have disabled Google Toolbar - in protest at poor practice. in CSS on all my sites to prevent this bar from popping up and shrinking viewable area of my site as it also pushes and distorts my existing social toolbars on my sites. This is one incredible WTF?! it pops up and freezes IE!!! The only way I can get out of it is to reboot! You can bet there will be a class action lawsuit on this one. OUTRAGEOUS! I'm very angry about this. Where does Google get off thinking they can trespass onto someone's actual website with a popup like this showing competitor information. How can smart people be so dumb.... Google, would you like Bing/Yahoo, et al showing up at the bottom of your search page? Google has hacked my website and added someone elses ads. Talked with 3 Google reps today and none of them claim they have ever seen "Google Related" ads. How can I get them off my pages? Please provide webmasters with a way to opt-out of this displaying adverts for competitors content (usually Google content) over our sites. It is hard enough to get search traffic from Google now you are ranking your own products above everything (regardless of merits). The way you have blocked the 'css method' of removing this shows just how much contempt you have for webmasters.